Like many people, Michelle Migliarese had spent years dreaming of owning a home. “I grew up in an Italian family who always said, ‘You can never go wrong with buying property.’ It’s always been a top priority of mine,” Migliarese says. 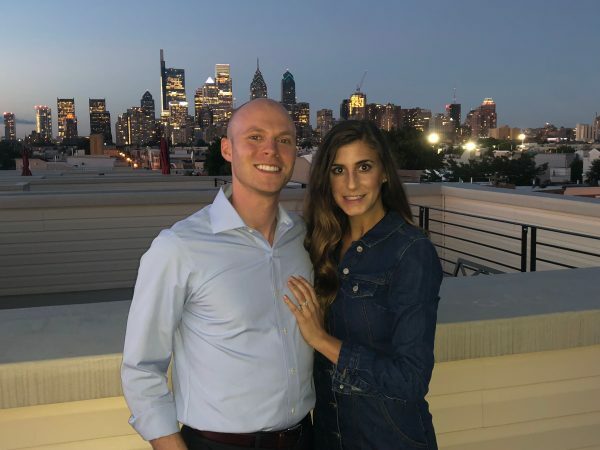 The 30-year-old regional clinical site lead at Pfizer saved diligently and bought a three-bedroom rowhouse in Philadelphia this year, where she now lives with her fiance, Jeremy. Michelle Migliarese and her fiance, Jeremy, have a postcard-perfect view of the Philadelphia skyline from their rowhouse rooftop. I was born in the suburbs of Philly and lived and worked there both before and after college. It’s also where I met Jeremy. 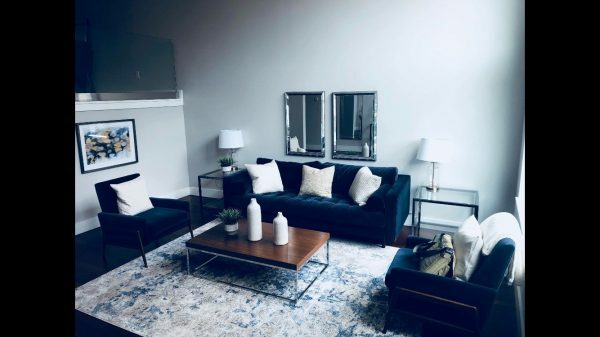 After reaching my goal amount in savings, Jeremy and I moved to New York City for two years, but we moved back to Philadelphia this past August because we were looking for better quality of life and wanted to buy a home for investment purposes. Why did you decide to buy a home in Philadelphia? We had been renting for about six years and decided that we were tired of spending so much money on rent. Plus, I had saved up enough for the down payment. I’m a really conservative investor, and investing in real estate was something I felt comfortable with, as opposed to the stock market. Philly is in a great, accessible location — it’s a quick trip to New York, Washington, D.C., and New Jersey — and it’s more affordable than New York City. Plus, my family is here. We were looking for an up-and-coming neighborhood that was walkable to Center City. The Point Breeze neighborhood fit that need. We wanted something big enough for visitors, so we settled on three bedrooms. Also, I work from home and needed space for an office. We were also looking for attributes that would differentiate this house from another one down the road. Parking is competitive in the city, and this home has a garage and a roof deck. We decided that because I travel a lot for work, we wanted newer construction because we didn’t have time to remodel. Two years ago when I was originally living in Philly, I thought about buying and started researching the market. Even after we moved to New York, I kept myself in the Philly housing market loop since I knew there’d be a day when we would come back. We came to Philly over the summer for just a day to look at eight homes with our real estate agent; our home was one of them. We closed on July 20th and moved in on the 29th. I really liked the mortgage broker we worked with, and he appreciated that I always came prepared. Being organized definitely helped speed things along. The home’s quality, design and layout is exactly what we were looking for. We could have a family here, so this is our home for the next five years at least. There was also the reassurance of the one-year builder warranty, which provides coverage on fixing structural elements of the home, including the roof, plus any leaks or electrical issues that might arise. Migliarese was drawn to the layout and design of the three-bedroom home. I’ve been a saver my whole life — it’s been instilled in me by my parents. I’m conservative with investments. My basic approach since Day One has been to calculate what I need to live comfortably and put the rest in savings. Whenever I got a promotion or a raise or changed jobs, I put additional money into my savings instead of increasing my spending. I consolidated my student loans as well. Our homebuying budget was $500,000 to $700,000, and we closed on our home for $635,000. Ours is the model unit, so I negotiated to include the staging furniture in the living room and kitchen; that helped a lot. The toughest part was being in another state and having to travel back and forth to look at homes. I think homebuying comes across as unattainable for young people in general, but having all of the knowledge that I have now, I definitely would have done this sooner. What advice would you give to someone considering moving to Philadelphia? Start with the neighborhood. There are a variety of neighborhoods in Philly, and each offer different perks and challenges. I wanted to be able to walk to Center City, so that was one reason why we went with Point Breeze. Parking is also a big issue; be sure you have a solution when deciding on a home. Sivan Ilamathi, the real estate agent who helped Migliarese find her home, shared his insights for those considering buying a home in the Philadelphia area. Depending on where you want to live in Philadelphia, a budget of $300,000 is reasonable. “If you want to live in Center City and don’t want to do a ton of work on the house, $300,000 is a good starting point,” he says, adding that it’s possible to find a “steal” around $200,000 if you’re willing to go farther south. The housing market in Philadelphia is cheaper than other major Northeast cities. “Compared to cities like New York City, Washington, D.C., and Boston, it’s way more affordable here,” he says. He mentions that many of his clients decide to live in Philadelphia and commute to work in New York City by train. Consider local mortgage lenders. Finding a reputable local bank for your loan could help you stand out. “Smaller local banks know the housing market and can give you a better interest rate than larger banks,” he says. Photos courtesy of Michelle Migliarese.